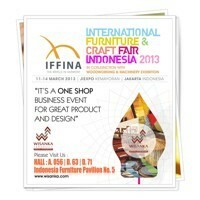 IFFINA 2013 will be held in Jakarta at Jakarta International Expo (JIExpo) Kemayoran. It is one of the international event which will show all Indonesian export products. Many companies are joining this exhibition to promote their business as well introduce their business to the new clients or customers. In this exhibition, multiple product range will be shown not only for furniture trading. It will also show mining products, agricultural and craft as well. WISANKA will be joining as one of the participants of IFFINA 2013. In this exhibition, WISANKA will promote our new collection of Indoor Teak Furniture, Natural Rattan Furniture and Lighting products. The exhibition will be open on March 11-14, 2013. Available for all range furniture collection both for indoor and outdoor in various materials for Wholesaler, Retailer and Hotel projects. Waiting to see you at the IFFINA 2013 ! !